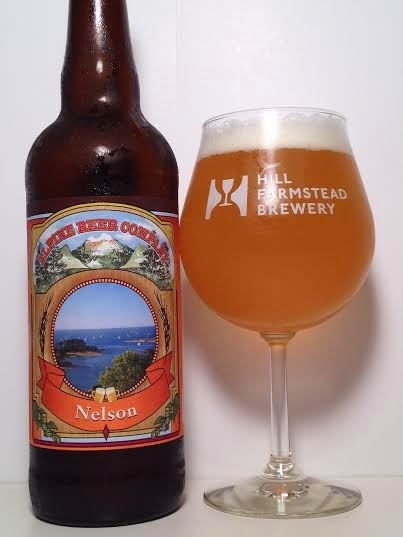 Alpine Nelson is an American IPA utilizing Nelson Sauvin hops from New Zealand. I love New Zealand hop beers, so I'm hoping this one blows me away. Pours a dark yellow, pale orange color with two fingers of white head. Right off the bat I get acidic grapefruit on the aroma. There is a considerable sweetness to this beer. It has a somewhat orange creme, almost sherbert smell to it. On the back I pick up some white grape and white wine aromas. This is more complex than I thought it would be. That acidic grapefruit is front and center, followed by an assault of white wine. It's pretty bitter and dry on the finish, but not before those tropical fruits hit you first. Imagine a slice of grapefruit dipped in white wine and that's what you're getting with Alpine Nelson. With an abundance of flavors and bitterness, Alpine Nelson is a winner. It runs the spectrum with it's sweet, creamy orange flavors to the white wine to it's dry, hoppy finish. The acidic taste is the only slight deterrent, but I will gladly let that slide.